This year I have tried to be more organised with regard to my productive garden (as well as my flower garden). I even tried to think about succession planting for once – I know that anyone with an interest in growing their own should do this as a matter of course, but I am not the most organised person and I leave the planning for my day job (or so I tell myself). This year’s master plan was to sow some dwarf broad beans (var. Sutton) early in the year and hope to harvest them in June. The idea being that this would then make room for my French beans in the small bed at the bottom of the garden. I started them off in February and planted them out at the end of March. 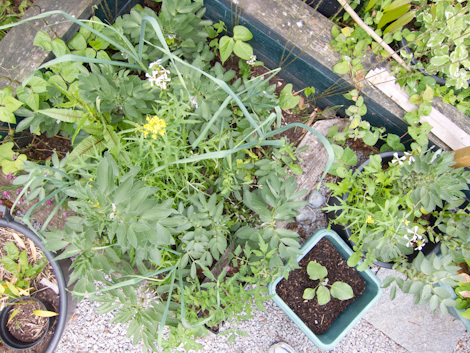 They grew quite well (some in the bed, some in a tub) and flowered a lot – as shown in the photo. However, the beans themselves seemed to take an age to grow – I harvested some in the middle of the month, but these were in the tub which still remains empty in the vain hope that I can get a courgette to grow and get a late crop; and the bed remained quite full – see picture below. I finally pulled the rest out last weekend – they were taking over and all of the salad leaves I had planted had gone quite leggy and had mainly been eaten during the damp weather. I planted out some more French beans as I think the prolific foliage of the broad beans had held some of them back, but I had already planted out my aubergines (new for this year for me), tomatoes and courgettes. Therefore, other than the aforementioned beans and some very healthy-looking (i.e. not yet ready to harvest) garlic, I think that it will be some more salad crops for the next month or two in this bed. 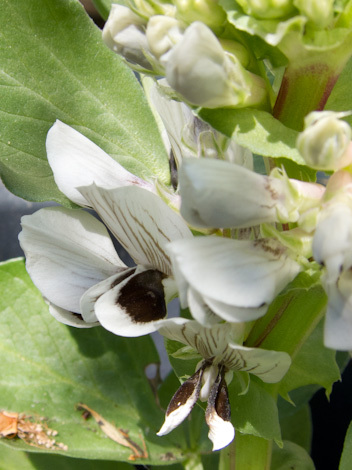 The sad thing is that the crop of beans was nothing to shout about – there were on average 3 beans per pod and about 4-8 pods per plant – hardly an abundance. I have decided to give broad beans a miss next year. As you can see from the photo of the bed at the bottom of the garden, my mizuna bolted in the warm May sun (as did the rocket), but I got several salads out of them before I pulled them up. I am not sure if pulling the mizuna up was a cunning plan as it was growing quite well, but was getting leggy. I have some more in pots amongst the tomatoes and courgettes, and some in modules waiting to replace them, so, for the first year ever I think I have had a modicum of success in the realm of salad leaves. I know they are supposed to be easy to grow, but I always seem to kill them off – usually by forgetting to water them. On the positive side the soft fruits are having a better year this year. Due to some mis-timed pruning last year we had zero blackcurrants – a fact that James is eternally ashamed of. However, he resisted the temptation to get the secateurs out this year and we were rewarded with about a pound of currants harvested a couple of weeks ago. 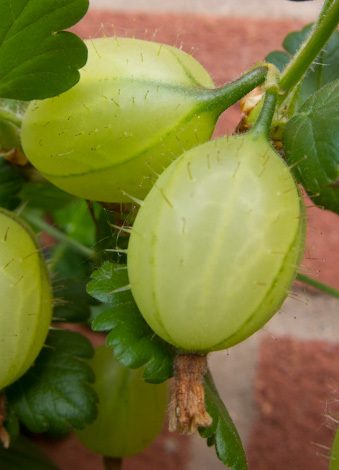 This is also the second year that we have had the gooseberry (var. Invicta) in the front garden and it is the second year that it appears to have avoided the attentions of sawfly. It seems to enjoy the extra sun and warmth of the front of the house, the crop this year (again harvested a couple of weeks ago) was about 3lb – about three times larger than last year. Not bad considering that when it was in the back garden we never got more than 6 berries! I struggle with motivation to go out and do anything in the garden in January – it seems to be dark almost continuously and (this year excepted) raining. 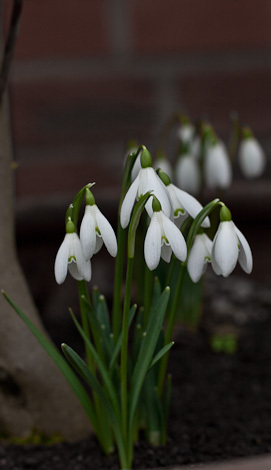 However, as February arrives there is the merest hint of Spring – heralded by the slowly emerging snowdrops. These are bulbs I have unsuccessfully tried growing for years – the breakthrough came when we were given several clumps by my mother-in-law and most of these seem to have taken. However, just as these start to show their first white flower buds, a small group that I planted a long time ago in with a camellia that lives near the house is already in full flower (as shown in the photo). These encourage me to go into the garden, have a general tidy up and see what is about. 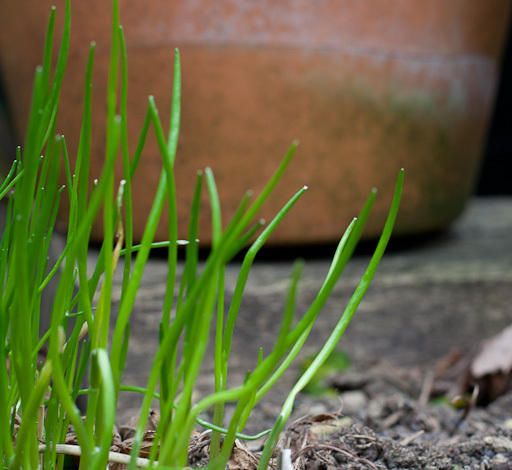 I am pleased to say that the garlic that I planted in the front and the back garden is starting to grow, although it is easier to spot in the back garden raised bed than hidden amongst the tulip and allium bulbs that are starting to show in the front garden. (Maybe one day I will be organised enough to mark where they are when I plant them.) The hellebores are the main providers of spring growth at the moment, but, somewhat belatedly, I have taken away most of their leaves, as recommended by both Monty Don and Carol Klein. This has left the earth looking somewhat bare, but did uncover some anemone blanda that I planted some time ago as well as the first signs of growth of the aquilegia. Elsewhere in the garden we have some winter scent from the sarcococca confusa that we have planted and colour from a winter jasmine and viburnum bodnatense dawn. In the front garden we have trimmed down all of the grasses, moved some of the zebra grass and pruned the white bramble that we have as a centre piece. In doing so, we uncovered about a dozen hibernating ladybirds – if they survive for another month or so we should have no trouble with greenfly this year! The home produce has hit a bit of a hiatus, although the rhubarb is starting to come up and we have lots of shoots on the blackcurrant. I have all my seeds ready for planting in the next couple of months, although I will mainly be concentrating on beans, courgettes, chillis and salad leaves in the hope of getting some good yields throughout the year (although the aubergine is an experiment probably doomed to failure). If successful I will move on and add one or more new types of produce next year. I am trying seeds from the Real Seed Company this year. I am hopeful that as they are all seeds grown on their farm in Wales there may be a better chance that they will grow here in Northamptonshire. They also encourage seed saving and send instructions with the seeds. It is also noticeable how many herbs have survived the Winter – I have lots of oregano, some sage, wild basil, rosemary, and burnet all looking healthy so far (and I have some hopes for the fennel that has been in for the last two years and is much beloved of hoverflies). The chives are also starting to show bright green shoots amongst the darker spots of the garden. Next year I will be adding borage (for bees) and sorrel (for soups) to the mix as well as more thymes and lavender (also for the bees). A bit too early maybe? As you can see from the photo, one of them is flowering already! This is about two months earlier than last year – I am a little worried it may be peaking too soon (although I have a dwarf chilli Prairie Fire that has been flowering but not fruiting all Winter). So, what has gone wrong this time? Last year we put the chillis on the north facing, cooler (as we use the room for only minutes at a time), back bedroom windowsill. This year they are on the south-facing, much warmer front room windowsill. It will be interesting to see if these work out well again this year. 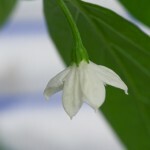 Posted on March 13, 2010 Categories Food, GardeningTags chilli, chilli flower, ripening chilis UKLeave a comment on A bit too early maybe? OK, so tinned tuna can be OK, depending on the way it is caught (assuming it is Skipjack tuna) cod and haddock, not so sure, bit debatable; this time it depends not only on the method of catching – line caught only please, but on the place where it is caught. Next on my list, purely because they are fish that are commonly sold and that I enjoy(ed) eating are sole and plaice, both, unfortunately, featuring on the Greenpeace red list. So, for starters, these are both flat fish, and, as such, live along the sea bed. This means that they are usually caught by beam trawling. This is a particularly destructive form of fishing for numerous reasons. Beam trawling involves dragging a large beam across the ocean floor behind which is pulled a large net. Typically trawlers pull one net on each side of the boat. Some also have ‘tickler chains’ in front which stir up the ocean floor so more creatures are caught up in the following net. As you can imagine this is a pretty indiscriminate form of fishing and the bycatch including immature fish, crabs, coral etc is huge (up to 70% by weight). However, there is an alternative, Danish Seine fishing, which is less damaging to the ocean floor and uses less fuel than beam trawling (hurrah). This uses a conical shaped net to catch the fish; although there is some ocean floor damage and some bycatch it is much less than the alternatives. Gillnets are also a better option, these catch the fish in the mesh of the net, obviously, the mesh has to be of the correct size so that small fish can swim through. So, onto the sustainability of the fish themselves. Plaice – current advice is to avoid fish from south west Ireland, west of Ireland, western channel and Celtic sea fisheries, whereas those of the Irish sea are thought to be sustainable. However, there is conflicting advice on North Sea stocks, Greenpeace stating that beam trawling in this area has caught too many small fish and stocks are unsustainable whereas the Marine Conservation Society currently states that North Sea stocks are ‘healthy and fished sustainably’ – no wonder eating fish causes such a moral dilemma! Sole – advice at the moment is that, again, beam trawling has had a massive impact on stocks, and the North Sea and Irish Sea stocks are depleted, so best avoided. Choose fish caught with more sustainable methods, avoid small fish and avoid fresh fish caught between April and June. Both Greenpeace and the MCS claim that Celtic sea stocks are sustainable (if, like myself you are not wise in the ways of seas, the Celtic Sea is that part of the Atlantic Ocean off the south coast of Ireland and the south-west coast of England and Wales). So, where to buy the holy fish grail? At the moment I cannot fully answer that but hope to have a more in-depth review of all of the supermarkets in the coming months. Having looked at the websites of the ‘better’ supermarkets, Waitrose and M&S, it appears that Waitrose use only Danish Seine methods and are no longer using smaller fish, although M&S are ‘leading the drive to reduce the use of … beam trawls’ (does that mean they do use them or not?) – it would appear that Waitrose are ahead of them there. Waitrose fish is from the North East Atlantic, and M&S is from the North Sea, English Channel and around Iceland. Are these sustainable fisheries – the packaging claims that they are, and the North East Atlantic and Iceland are not mentioned in good or bad terms on the MCS or Greenpeace websites, the English Channel and North Sea being more questionable. A quick Google search reveals the North Atlantic area to include parts of the Atlantic west of Ireland, areas north east of Iceland and a pocket in the Norwegian Sea. So, my conclusion, plaice and sole are in trouble, mainly due to unsustainable fishing methods, and, those caught around the British shoreline seem particularly at risk. The information about flatfish from other areas is not so clear, but this may be because they are of less immediate concern. As ever, it appears the fishing methods are crucial and any fish caught by beam trawling, and, I would go so far as to say any fishmonger who sells fish caught using beam trawlers, should be avoided. I feel a little more at ease buying my lemon sole or plaice from Waitrose, but I will probably be doing so less often than previously (perhaps once a month), M&S still don’t get my vote as they seem to be behind Waitrose both on fishing methods and sustainable fisheries. We all know that fish stocks are declining, but we are told that we should eat two portions of fish per week, and most of us indulge in the (hopefully) occasional fish and chip supper – so are our food habits compatible with living an ethical lifestyle? In the second post trying to unravel the tangle that is the topic of sustainable fish I examine whether cod and haddock are OK to eat with a clear conscience. Let’s deal with the easy bit first – unless you know where you local chippy is sourcing its fish from then, I am afraid, that the answer is a definite no. I believe that there are fish and chip shops that do advertise the origin of their fish – but none of these are in Daventry. If you can’t live without your take away, then I would suggest that haddock is a better choice than cod, but your conscience will still find you. And so to the sustainability of cod and haddock. Stocks of both have been overfished and in many areas continue to be so. According to Greenpeace, most cod fisheries in the Northeast Atlantic are in poor condition, except for Iceland and the Barents Sea where there is better management. All stocks are however, ‘overfished or at risk of being unsustainably harvested’. Haddock has had a similar history, but there is a little more hope. Northwest Atlantic stocks were overfished in US waters until the middle of the 1990s, but since then there has been some recovery. Scientists now believe that some North Sea stocks can be fished sustainably, whilst West of Ireland and Icelandic fisheries need better management. They are also recommending the closure of the fisheries of the West of Scotland. A further complication arises from the fact that cod are also caught when fishing for haddock. So, it would seem that maybe you can eat an occasional piece of cod or haddock with a clear conscience, but, as ever, it comes with a caveat. It also matters how your fish is caught. In common with lots of fish that live near the sea bed, a lot of cod and haddock is caught by bottom trawling. Not only does trawling result in a large bycatch (typically 30% of the catch by weight is thrown back dead or dying – these are mammals, juvenile fish, turtles and sharks) but it also damages the sea bed. Instead Greenpeace are recommending buying only line-caught fish – this is a more selective fishing method without the associated bycatch and the degradation of the seabed. According to Greenpeace Atlantic cod and haddock should both be avoided unless the cod is from Waitrose or Marks and Spencer or is line caught or the haddock is Icelandic line caught. But wait a minute, didn’t the scientists say that the Icelandic haddock fisheries need better management – they certainly did, and that all stocks are at risk from overfishing? Does this help – I am not sure. What makes Waitrose and M&S fish so special? A look at Waitrose’s website and my local branch’s fish counter shows that the haddock and cod is indeed Icelandic and line caught, and this includes their prepacked breaded range. M&S’s website leaves me with more questions than answers though. Although M&S now source their cod and haddock from Iceland, their website states that the fish is air-freighted in – how is that sustainable? Their cod is line caught, but, apparently the haddock is trawled or line-caught, and smaller haddock are caught from the west coast of Scotland. This seems to go against the Greenpeace guidelines – maybe they just need to update their website? I hope so – as it makes me start to question the validity of Greenpeace’s advice. My take on cod and haddock? Both are under pressure, fishing methods need to be changed to reduce the amount taken from the sea, and, we have to pay a little more, eat and waste a lot less and hopefully fish stocks may recover. Will I eat cod and haddock again? Probably, in the future, eventually, but I don’t need to eat fish more than every other month and I will insist on it being line caught. 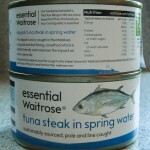 In the meantime I will stick to my pole and line caught, Waitrose own brand, tinned tuna. There has been a lot of publicity about the imminent demise of tuna in the last year. Whilst most of the attention has been on Bluefin tuna it opens a whole can of worms with regard to the tuna usually bought in UK supermarkets. So, what are the different types of tuna and which ones do we commonly eat (fortunately Greenpeace has a helpful guide). There are 23 types of tuna, and, according to Greenpeace, 22 of them are vulnerable. The main market for the aforementioned Bluefin is Japan which takes 90% of the catch. 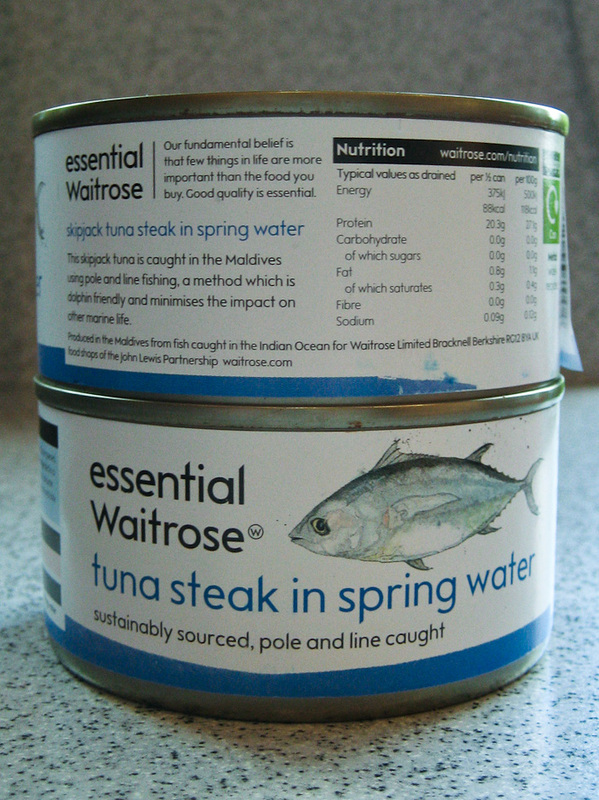 In the UK we consume some Yellowfin Tuna (sold as steaks at the fresh fish counters and in some tins – to be avoided if it is not caught by sustainable methods) along with Albercore and Skipjack (also in tins). By far the most common is Skipjack which is also the tuna most likely to be found in ready meals and pre-prepared sandwiches. The UK is the second biggest consumer of tinned tuna (after the US) and so I will concentrate on this source. Following on from the publicity, there have been declarations of never eating tuna again, no more tuna sandwiches, but is this entirely necessary. According to the Ecologist, it probably is, according to Greenpeace, on whose survey the Ecologist article was largely based, tinned tuna need not disappear from our collective menu. So, just what is the problem with tinned tuna from a sustainability point of view (ignoring the potential problem of mercury in fish)? A lot of tuna is caught in large nets or by lines up to 100km long. We all remember the adverse publicity that came from pictures of dolphins caught in the net and the advent of ‘dolphin-friendly’ labels on tins of tuna. However, dolphins are not the only bycatch of the tuna industry, other marine species that are caught include several species of turtle, sharks, rays and young tuna. These together constitute about 10% of the catch with some fishing methods, which is where most of the problem with eating Skipjack tuna lies. Much of the tuna fish destined for the tinned market is caught using large nets (purse seines) with floats on to encourage the fish to gather together which is where this bycatch is at its worst. What can we, as consumers, do about this? There are more sustainable methods of fishing, such as pole and line, which target the adult fish and therefore avoid much of the bycatch. These also tend to be smaller outfits that are more likely to support local projects and which will look after local fish stocks, being unable to move to other areas once a resource has been used up. Therefore, always look at the label to see what kind of tuna it is – if it is yellowfin, is there a skipjack alternative (these are more numerous than yellowfin)? Next look at the method of fishing. Waitrose, have recently introduced an own label tinned tuna which is clearly marked as being caught by pole and line methods. If they don’t state on the tin, assume the worst – with the recent publicity it is in their interests to tell you if it is a sustainable method. John West and Princes are the two largest brands in the UK, they were bottom in the recent Greenpeace survey and do not seem too interested in changing their ways. I checked John West, in most cases they do not state either the type of tuna or the method of catching it. On the contrary, Sainsbury’s who came top in the original survey have gone 100% own brand pole and line and introduced a branded pole and line range. M&S are also moving to 100% pole and line for their own brands and are extending it to the tuna used in their sandwiches, salads and ready meals. The other supermarkets seem a little less responsive, maybe they will catch up. I have recently written to Waitrose, my supermarket of choice (as I only have Tesco and Aldi as local alternatives) asking them to stop stocking other brands which do not conform to their own standards (ie John West), I doubt that they will do this, but, if sales of this brand were to drop relative to their own, more ethically produced brand, then maybe they will think again. So, I don’t have to stop buying my tinned tuna, I just have to be a little discerning and boycott the larger brands in the hope that declining public opinion and sales will give them a reason to look at their social responsibility.